Earlier this spring our owner ventured up to Minnesota for a family wedding. Little did he know it would take place at the gorgeous facility of one of our customers! Settled in the gently rolling hills of Minnesota’s Sogn Valley, just south of Minneapolis, is the city of Cannon Falls. 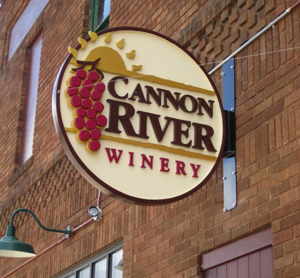 Located in the heart of downtown Cannon Falls you will find the Cannon River Winery. This beautiful old building houses a winery on the first floor and event center on the second floor. The vineyard sits just outside of town. Originally built as an auto dealership in the early 20th century, the building has seen several interior transformations, including hosting a roller rink on the second floor. On the exterior, the front façade is brickwork and the side and rear walls are constructed of rock face (rusticated) concrete block. When the current owners, John and Maureen Maloney, began renovating the building they worked to maintain its historical integrity inside and out, as the building is on the historic registry. Aside from completing the beautiful renovation of the interior, the exterior was also a primary focus. Some of the damaged rock face block along the sides and back of the building were replaced using exact replicas from Classic Rock Face Block. After repairs were made the owners had a team led by the former Cannon Falls High School art teacher paint an AMAZING mural covering the entire west facing block wall. What an amazing place! According to the boss, the venue was spectacular and the wine even better. Hopefully the rest of us here will have the chance to visit soon! For more information on the beautiful Cannon River Winery and Event Center visit www.cannonriverwinery.com. “Event Center at Cannon River Winery up and Running.” Cannon Falls Beacon. N.p., 13 Aug. 2014. Web. 29 June 2016. <http://www.cannonfalls.com/>. Stark, Troy. “Cannon River Shoots for the Stars in Minnesota.” Midwest Wine Press. N.p., 31 July 2012. Web. 29 June 2016. <http://www.midwestwinepress.com/>. Busiahn, Nancy. “Winery Mural Attracks Attention, Compliments.” Cannon Falls Beacon – Cannon Falls, Minnesota 55009. N.p., n.d. Web. 30 June 2016. <http://www.cannonfalls.com/>..